The Life, Travels, and Travails of a Mormon Convert from Nauvoo to "Winter Quarters" and the Salt Lake. This collection is a historically significant correspondence which will be of great interest to scholars and researchers of the history of the Mormon Church, religion in America, and of the singular experience of the Mormons in the American West. The letters detail the experiences of a Mormon convert from the period of the persecutions in Nauvoo, life and conditions at "Winter Quarters" in present day Nebraska, and the early days of the Mormon settlement of Salt Lake City. These letters have never been published or utilized by any researcher or scholar. The stage was set for confrontation. Alley describes the events preceding Smith's arrest and murder in the jail at Carthage. Alley describes the reaction and immediate aftermath in Nauvoo to the murder of the Mormon patriarch, and the interim period as the town, surrounded by mobs awaited its fate. Alley's letters convey the fear the Mormon community was experiencing as they fully expected to be massacred. The Mormons under an ultimatum were forced to abandon Nauvoo and fled west in 1846 to "Camp Israel" or "Winter Quarters', located in present day North Omaha, Nebraska overlooking the Missouri River. Alley describes the gun battle which erupted between the few Mormons left behind in Nauvoo and the mob which descended upon the town as the Mormons departed. Alley describes the trek of the approximately 2500 Mormons west to Winter Quarters. 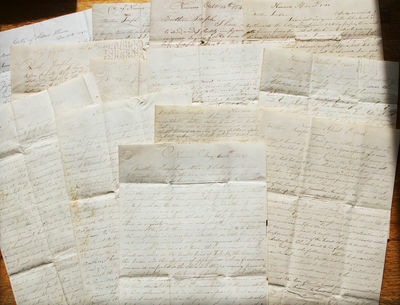 Alley's letters from Winter Quarters provide a rare and detailed description of life and conditions there, which were especially difficult during 1847, the Mormon's first year there. He describes the transition from a tent, to a log cabin city, and the efforts of the Mormons not only to survive, but to gather sufficient supplies and resources to enable their journey further west. Alley was selected to go in the first company of pioneers to settle the newly selected site of the Mormon settlement near the Great Salt Lake. But he was unable to do so as his teams were too weak from a long winter without sufficient feed. When Alley and his family did emigrate in 1848, they traveled in the same company as Brigham Young. George Alley's daughter Margaret was one of Brigham Young's plural wives, and had several children with him. Additionally, Alley's younger daughters, Lydia Anne Alley and Susan Hannah Alley, were each the plural wives of Nauvoo Legion Lieutenant General Daniel H. Wells, who also served as the first Attorney General of the State of Deseret, Second Counselor to Brigham Young in the First Presidency of the church, and as Counselor to the Quorum of the Twelve. Alley describes in great detail the establishment of Salt Lake City, how it was laid out, the irrigation projects, the construction of the Temple, the flood of emigrants, and travelers to the gold fields of California who passed through the city. Troubles with Native Americans and hordes of locusts are narrated. Alley describes the additional settlements being established in Utah to accommodate the stream of new Mormon settlers, many of whom were from overseas. He provides an account of the arrival of the Mormon Handcart Pioneers in 1856, and the efforts to rescue them from the heavy snow and freezing temperatures they had been caught in while crossing Wyoming. The Mormon War of 1857-58 is also detailed. Alley describes the fear and tensions which led to the evacuation of Salt Lake City, the arrival of Federal Troops, and the problems created by the civilian camp followers of the army, crime, Salt Lake City's first murder, and related social problems. The letters are revealing of the tension between Alley's love for his family and for that of his new Mormon faith. Alley, while relating the historical events he was participating in, also defends in passionate terms, his Mormon faith and its practices from criticisms leveled by his brother. Alley's letters touch upon many points of Mormon theology, vicarious baptism, blood atonement, and, polygamy. Alley refuses to return to Massachusetts after the death of Joseph Smith, evidently under great pressure to do so from his brother Joseph, from whom Alley was also seeking financial assistance due to the economic turmoil in Nauvoo created after Smith's murder. The Mormon's were forced to abandon their property and flee the city with whatever they could carry. Alley writes movingly of his determination to follow his faith and states that he would never return home. Alley had no money and was forced to continue to seek financial assistance from his brother while in Winter Quarters so as to be able to purchase the supplies he would need for the overland journey to the Great Salt Lake. Joseph Alley, while evidently critical of the "Mormon delusion", as his brother ironically called it, rendered his brother George every possible assistance, and apparently took up a collection among family members. This financial assistance of Joseph Alley was crucial for George Alley's survival in Winter Quarters and his eventual emigration to Salt Lake City. Alley gives a lengthy and passionate defense of his church's doctrine of polygamy, which Joseph Alley must have found hard to reconcile. George defends his daughter's plural marriages and invites his brother to travel to Utah and see for himself whether the Mormon faith and its practices were as abominable as claimed. He writes that he will be able to introduce his brother to the first people of the place, Brigham Young and Daniel Wells, without leaving his family circle. The letters poignantly speak of Alley's longing for acceptance and contact from his family. His wife's family seems to have renounced all contact with Mary Symonds Alley after the couple's conversion to Mormonism, which evidently caused Alley considerable pain and regret. George Alley found happiness in Utah, building a home in Salt Lake City and tending and raising his orchards and other crops to feed and care for his family. George Alley was born December 30, 1792, in Lynn, Essex County, Massachusetts, the son of Joseph Alley and Hannah Batchelor. He married Mary Symonds September 15, 1822, together the couple had seven children: George H., Margaret M., Lydia Ann, Susan H., Stephen W., Elizabeth R., and Charles H. George Alley and his wife were baptized in the Mormon faith in 1842 by Erastus Snow. Together the couple, new Mormon converts, emigrated along with their children to Nauvoo, Illinois in 1842. George Alley's uncle John Alley (1777-1851) and his wife, Mercy Buffum Alley, appear to be the first of the Alley family in Massachusetts to have been introduced into the Mormon faith by Orson Hyde and Samuel Smith. John Alley and his family also emigrated to Nauvoo at the same time. John Alley was a successful businessman and acquired a number of property holdings there. Prior to the spring of 1843, John Alley had split with Joseph Smith and Mormonism, and returned to Massachusetts, while George Alley does not mention the cause for this split, but its timing indicates that the likely cause was dissatisfaction with the practice of polygamy. Sarah Buffum Alley, a daughter of John and Mercy, who remained with the church, was joined in plural marriage to John Bates Noble in Nauvoo on April 5, 1843, Joseph Smith himself, reportedly officiated. Their son, George Omner Noble, was born February 2, 1844 in Nauvoo and is reportedly the first child born to a Mormon polygamous couple. Sarah Alley Noble died December 28, 1846 in Winter Quarters. George Alley was in Nauvoo during the period of the persecutions and when Joseph and Hyrum Smith were murdered. The family fled Nauvoo across Iowa and arrived at Winter Quarters in Nebraska late in 1846. The family spent the winter of 1846-1847 there and endured the privations of a winter on the plains. Alley and his family emigrated to the west in 1848 traveling with Brigham Young's company on the journey to the Salt Lake, where they arrived September 20, 1848. Alley settled first on North Canyon Art (Bountiful), where Alley built a log cabin and moved in with his family in December, 1848. During the winter of 1848-1849 the family suffered considerably through lack of sufficient food. In the spring of 1849 Alley moved his family to the City and located permanently in the Eighth Ward. Here he died, as an Elder in the Church, November 1859. At the time of his death he held the office of a Seventy.